Weighty Matters: Badvertising: Chips are Vegetables, Right? So after I eat my heart chips, I'm going to have a hearty serving of vegetables. No stupid broccoli for me. Kiss my artichokes goodbye. 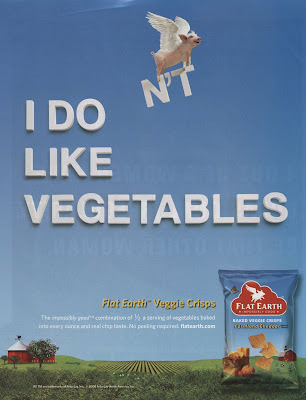 From now on I'm going to have Flat Earth Impossibly Good vegetable crisps. I don't care that they're not whole grain because I'll get my whole grain from those Sun Chips. I don't care that they've got piles of sodium and calories because there's a half a serving of real vegetables in every ounce. Let's see....if I have 8 ounces a day that's like 4 "vegetables". Of course it's also over 1000 calories and a day's worth of sodium.